Barcelona has it’s own public bicycle program! 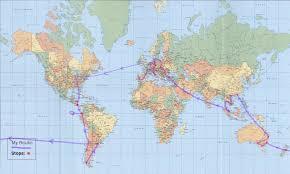 It has been a long dream of mine to travel around the world. Literally. Circling the planet in one direction, chasing the sunset so to speak. Circumstances haven’t allowed it until now, and I am happy that David and I are both at a point in our lives where we can create the kind of trip we want and hopefully do it the way we want. We are no longer dirt poor college students, and don’t yet have children who depend on us for their every need. We do have a mortgage though, and that’s going to be tricky, but with enough savings and booking extra photography gigs, we hope to come out of it with a new perspective and an experience of a lifetime. Did I mention we are doing this all in the span of seven weeks?! Where the heck are we going, you ask? Well, this was the part of the planning that probably took the longest to decide. We pinned up a map in our dining room and for the last six months have been moving little red push pins around all over. It’s full of holes now, but we managed to finalize our itinerary and dates without killing each other.